When Astadia needed to rebrand five locations with new lobby signs they called The Mighty Sign Makers for rebranding help. With just a single point of contact, our client was able to complete sign projects in Dallas, TX; Houston, TX; Jacksonville, FL; Raleigh, NC; and Nashua, NH. This meant that our client’s marketing team could stay focused on the needs of their customers instead of all the details involved in coordinating a lobby sign project in each location separately. Specialty Graphic Solutions fabricated, shipped and installed five great lobby signs. This ensured a consistent and high-quality brand image is conveyed in all of their US offices. Ordering and installing new signage, as part of a company rebranding, is often one of the last priorities. Corporations with multiple locations nationally or internationally either have an in-house design department or they use a separate design company. What they don’t have is production and installation capabilities. That is where we come in. At Specialty Graphic Solution, we make it easy to create signs for multiple locations. We take care of all the details for you – including arrangements for local installers to ensure your new signs are displayed professionally in each unique location. It was exciting to work with Astadia as their company starts this new chapter. The company specializes in streamlining and improving data resources for businesses so they can function better and grow. We will help you Get Noticed when rebranding, lobby signs, reception signs, corporate values and core belief displays and other indoor signage. The Mighty Sign makers also produce excellent building signs, vehicle graphics, fleet graphics, trade show displays, window graphics, event signage, wall murals and more. It’s about that brushed metal letters on a reclaimed wood wall, isn’t it? There are things we can’t control. It’s a fact of life. Some things just happen and you can’t stop them. One of the things you control is creating an exciting lobby sign for your reception area. If you think the lobby sign isn’t putting your companies best foot forward then it’s about time you did something about it. Go to your lobby and look straight in the reception desk and if you are not blown away you have an opportunity. It’s a shame because it was a good lobby for someone back in the days before you bought the building. Now, it wishes it were younger and better looking, so it’s just bitter. It drives away your business, makes you look bad, and even though your mom keeps asking you to give it another chance, it’s time you let it go. You might have some reservations. You have fond memories of when you first walked in those doors and decided to buy the space. You can remember your first client sitting, just there, in that horribly ugly green chair. Just remember you didn’t turn your back on the lobby, it turned its back on you. Your lobby sign is the first thing that people see when they come into your space. It does two things. First, it lets people know that they’re not lost and that this is the building they were looking for. Next, it sets an impression of you and the way you do things. Your lobby is usually the first thing in your building that really works to build your brand. When people realize that they’re in the building they need to be in, don’t make them regret it. With Specialty Graphic Solutions, we can help you make sure that your lobby leaves an awesome first impression on anyone who visits your office. 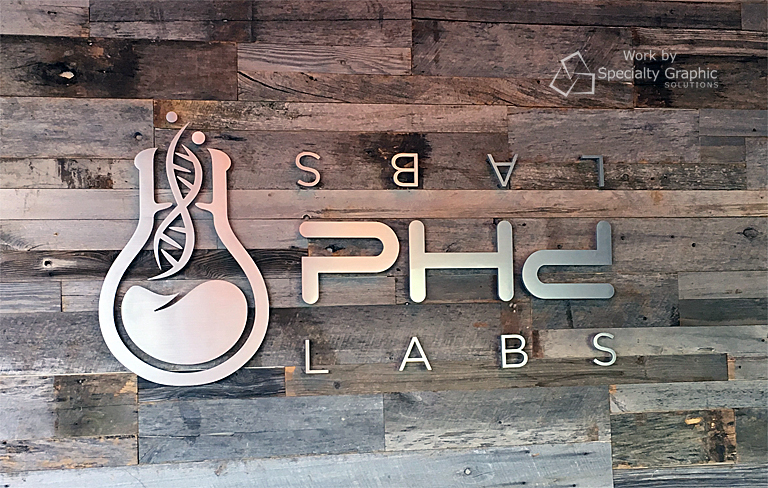 We make awesome lobby signs that can build your brand the minute people walk in your door. You’ll let people know where they are, but also who you are. You can start making that good impression with a professional modern sign made to your specifications in your desired material. Depending on the look you want and the message you want to send, you can choose from glass, metals, wood, stone, or different types of lettering to make your sign and your lobby your own. We also have tons of other products that can add a bit of flair and personality to your lobby. From prints and banners to wayfinding and ADA signs, we can provide all kinds of products that can help you with your lobby problem and build your brand. With a brand-new lobby sign and a few of our graphics, you might even be able to keep that ugly green chair. Get a free quote on lobby signs today! Metal Letter Logo Lobby Sign in Battle Ground WA Shine for Chiropractor! What’s the supporting structure of buildings made out of? What’s the main material used in the construction of bridges? What makes safes so indestructible and secure? Okay, pencils down. The answer to all of these questions is metal. Metal can stand up to just about anything, especially if you believe the 9/11 conspiracy theories. This material is also valued for its professional and traditional appearance. That’s why Fireside Chiropractic contacted Specialty Graphic Solutions for a metal letter logo lobby sign in Battle Ground, WA. Located on West Main Street in Battle Ground, Fireside Chiropractic is the practice of Dr. Kirsten Friberg. The good doctor got her Doctorate in Chiropractic degree from Life Chiropractic College West. She learned many different methods and techniques of adjusting while attending school, including the use of the Drop Table, Activator, Gonstead, and Diversified techniques. The practice’s mission is to inspire entire families to function at their optimal level through vitalistic approaches to their health and chiropractic adjustments. 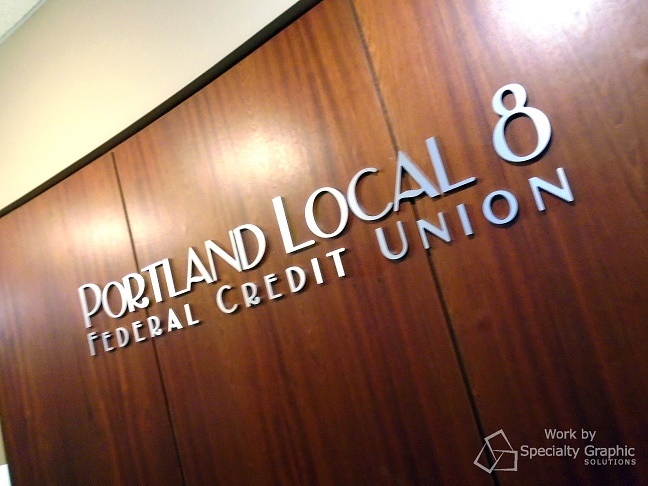 When such a great organization that helps local residents with their spinal issues came to us for a metal letter logo lobby sign in Battle Ground, WA, we were more than happy to make the necessary adjustments to their reception area. Fireside Chiropractic had recently created a new wood reception area, and they wanted an awesome sign to complement the look. Fortunately, they had the mighty sign makers on the case. With it being winter and all, we welcomed the opportunity to warm our hands in a place called Fireside Chiropractic. So, we were happy to perform a site evaluation and listen to what they had in mind for their project. They already had the sweet wall and the stellar logo. They just wanted to combine the two to create a branding powerhouse. We recommended a metal logo and lettering. They thought that was an excellent idea, and once they approved the mockups, we got down to work. Creating this sign took a lot of work in our shop. First, the letters were routed to match the font Fireside Chiropractic uses. Each letter has multiple stand offs for support, which were screwed into the letters to make them incredibly stable. Once all of the elements were ready, we high-tailed it over to the client’s venue for the installation portion of the show. We used a design template to ensure proper placement on the wall. You see, each stand off required a drill hole in the wood. You can’t patch and paint wood, so as Eminem or Hamilton would say, you only get one shot. Luckily, we nailed it. In the end, the colors of the design and the metal pop off the wall for a distinguished look. Fireside Chiropractic was thrilled with the job we did. Are you interested in lobby signs that really pop? 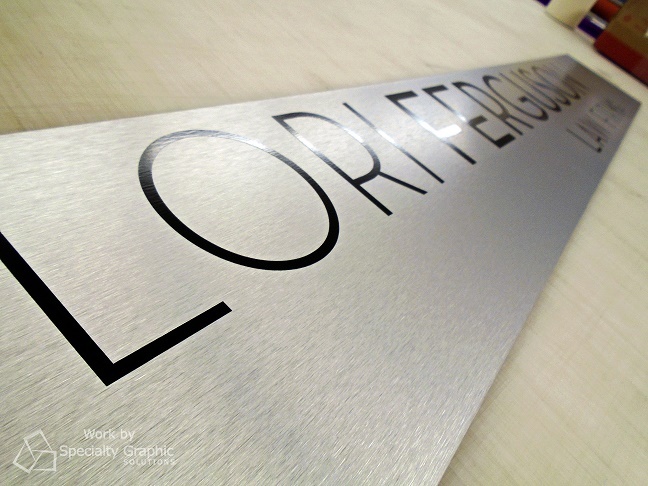 If so, contact the mighty sign makers at SGS today for a free consultation and quote on metal letter logo reception area signs. We are interested in Lobby Signs that Pop! Reception Area Sign for Biggs Insurance in Vancouver! Is there any industry more competitive than the insurance industry? You can just smell the desperation dripping from that long-lost-and-forgotten high school acquaintance as they run into you at the Wine and Jazz Festival or other events and promptly start asking about whether you have life insurance. Smart insurance agencies don’t need to rely on awkward “natural marketing.” They realize that branding is the key to sales success. If your insurance company’s name is ingrained in people’s heads, then you’re the one they’ll contact when they need homeowner’s insurance. Biggs’ Insurance Services is well aware of this, so they contacted the mighty sign makers at Specialty Graphic Solutions for reception area signs for insurance agencies in Vancouver, WA. No, Biggs Insurance Services isn’t the insurance company started by American Pie star Jason Biggs after they stopped making straight-to-DVD sequels. They go back much further than that. In 1935, two brothers founded The Whitfield Company real estate and insurance agency. Don Biggs purchased the company in the ‘50s and gave it his name. Now, from the corporate office on Main Street in Vancouver, they offer auto insurance, homeowner’s insurance, surety bonds, risk management services, life insurance, and much more. When a business that does such a good job of keeping local individuals and businesses from facing financial disaster came to us for lobby signs for insurance agencies in Vancouver, WA, we were glad to be of assistance. They have a nice dimensional letter sign on the exterior of their building, but they wanted a way to welcome clients into their reception area. We knew just what to do. We met with Biggs to discuss their ideas for the project, and so we could take a closer look at their venue. They had a big, blank focal wall that would look rather nice adorned with a lobby sign. Based on their vision, budget, and branding, we came up with an art proof of what their finished sign could look like. They loved it, so we started fabricating it. We started with a simple white panel and added cut vinyl graphics that perfectly matched Biggs’ branding. It’s important to have your marketing materials match if you want to maintain brand consistency. It’s like branding someone’s brain with your company’s logo: they can’t help but think of you when they need your services. Once the piece was ready, we worked with Biggs’ schedule to install the markers when they weren’t trying to conduct big business deals. We mounted the sign with standoffs so it looks like it floats off the wall. In the end, we had another satisfied client. Tired of feeling like ol’ Needle Nose Ned accosting Bill Murray with insurance pitches in Groundhog Day? Try a new tactic: boost your brand recognition. This can be done by creating a snazzy logo and getting it in front of as many eyes as possible as many ways as possible including in your lobby area. we’re ready for a fantastic lobby sign! To drive sales today, contact the mighty sign makers at SGS for a free quote on lobby signs.